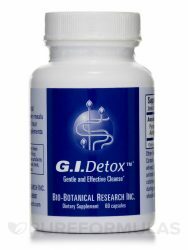 If you’re looking for a supplement that could potentially work to cleanse your gastrointestinal tract‚ you might want to try Bio-Botanical Research’s G.I. Detox™. First‚ each capsule of G.I. Detox™ provides over 500 milligrams of pyrophyllite clay. Notably‚ the electrolytes in this clay contain free ions that might serve as antioxidants; as a result‚ this Bio-Botanical Research supplement may work to protect your cells from free radical damage. Moreover‚ pyrophyllite clay’s negative electro-magnetic charge means that it may be able to draw toxins out of your tissues and organs. In addition‚ the activated charcoal in G.I. Detox™ could potentially act to bind with toxins and other unwanted substances in your gut; this makes them easier to remove from your body. According to proponents of alternative medicine‚ activated charcoal may also help address certain symptoms associated with minor gastrointestinal discomfort‚ such as mild gas or bloating. Take 1-2 capsules with a full glass of water between meals or as directed. Take 1 hour apart from other supplement or medications. Your gastrointestinal health may be under attack by a number of factors, such as poor dietary choices, high levels of stress, and even frequent travel. These factors can have negative effects on the health and balance of the microflora that live in your intestines. 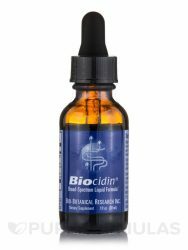 Biocidin LSF is a dietary supplement and broad-spectrum liposomal formula from Bio-Botanical Research that contains all-natural ingredients to support optimal intestinal ecology and G.I. health. Bilberry extract (25% anthocyanosides), Noni, Milk Thistle, Echinacea (purpurea & angustifolia), Goldenseal, Shiitake, White Willow (bark), Garlic, Grapeseed extract (min 90% polyphenols), Black Walnut (hull and leaf), Raspberry, Fumitory, Gentian, Tea Tree oil, Galbanum oil, Lavender oil (plant and flower), Oregano oil (plant and flower), <5% alcohol (potato and/or cane source). 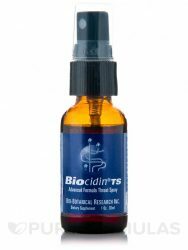 Biocidin® TS Advanced Formula Throat Spray by Bio-Botanical Research provides a blend of herbs and essential oils that could potentially work to relieve certain symptoms associated with sore throats. First‚ grapeseed extract might have a gentle anti-inflammatory effect‚ which means that Biocidin® TS Advanced Formula Throat Spray may act to soothe irritated tissues in your throat. Additionally‚ the bilberry extract in Biocidin® TS Advanced Formula Throat Spray contains tannins that can serve as astringents. Since astringents strive to constrict and tighten swollen tissues‚ they might act to relieve minor discomfort and inflammation. This Bio-Botanical Research supplement also contains two forms of echinacea (purpurea and angustifolia). Since both types of echinacea could potentially act to stimulate immune activity‚ they may work to alleviate sore throats associated with mild upper respiratory infections. Last‚ tea tree oil may offer some relief from oral candidiasis‚ which is a fungal infection that can occur in the throat. Alcohol 60% (potato and/or cane source)‚ Vegetable glycerin‚ Bilberry extract (25% anthocyanosides)‚ Noni (fruit)‚ Milk Thistle (seed)‚ Echinacea (purpurea & angustifolia)‚ Goldenseal (root)‚ Shiitake (plant)‚ White Willow (bark)‚ Garlic (bulb)‚ Grapeseed extract (min 90% polyphenols)‚ Black Walnut (hull and leaf)‚ Raspberry (fruit)‚ Fumitory (herb)‚ Gentian (root)‚ Tea Tree oil (leaf)‚ Galbanum oil (resin)‚ Lavender oil (plant and flower)‚ Oregano oil (plant and flower). Certified Organic or wildcrafted sources used whenever possible. Suggested Usage: Spray 1 – 3 times in mouth towards back of throat as needed. Discontinue use should adverse reactions occur. 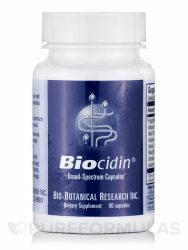 Biocidin® Capsules by Bio-Biotanical Research contain a wide array of herbs and nutrients that may work to support gastrointestinal health. First‚ grape seed extract contains tannins that might act to relieve minor constipation. Notably‚ the grape seed extract in Biocidin® Capsules is also high in polyphenols‚ which is important because polyphenols may work to protect your cells from free radical damage. Moreover‚ this Bio-Botanical Research supplement provides tea tree oil as well as other essential oils that may work to dissolve biofilms‚ which are colonies of microorganisms that can attach themselves to your gut and inhibit immune function. Therefore‚ this product may help address certain symptoms associated with minor upper respiratory infections. Last‚ Biocidin® Capsules are small and easy to swallow. Bilberry extract (25% anthocyanosides)‚ Noni‚ Milk Thistle‚ Echinacea (purpurea & angustifolia)‚ Goldenseal‚ Shiitake‚ White Willow (bark)‚ Garlic‚ Grapeseed extract (min. 90% polyphenols)‚ Black Walnut (hull and leaf)‚ Raspberry‚ Fumitory‚ Gentian‚ Tea Tree oil‚ Galbanum oil‚ Lavender oil (plant & flower)‚ Oregano oil (plant & flower). Start with 1 capsule per day and gradually increase to 3 capsules per day or as directed. May be taken on an empty stomach or with a small meal as desired. If you’re looking for a supplement that could potentially work to support gastrointestinal health‚ you might want to try Bio-Botanical Research’s Biocidin® Advanced Formula Liquid. First‚ Biocidin® Advanced Formula Liquid contains bilberry. Notably‚ the bilberry extract in this product has been standardized to provide 25 percent anthocyanosides; since anthocyanosides are plant pigments that may serve as antioxidants‚ this Bio-Botanical Research supplement could potentially work to protect your cells from free radical damage. Due to its gentle anti-inflammatory effect‚ bilberry may also help address certain symptoms associated with minor diarrhea. Begin with 1 drop and gradually increase up to 5 drops 3 times per day or as directed by a healthcare professional. Children may use 1 drop per 10 lbs. of body weight per day‚ divided into 2 or 3 doses.